24 Carat Gold Plated OM / AUM Symbol Wall Picture Frame. The spiritual icon AUM or OM Picture is engraved on 24 Carat Gold Plated Copper Sheet and framed with very high quality material. This Picture has great detailing in the Icon depicting AUM with beauty and elegance. The Gold-Plated sheet inside is resistant to weather and lasts a lifetime. OM is an ancient Sanskrit word that was first felt by rishis as they meditated. It is somewhat difficult to describe with words but Om represents everything. It is said to be the seed of all of creation, It is also a mantra in Hinduism, Buddhism, Jainism, and Sikhism. 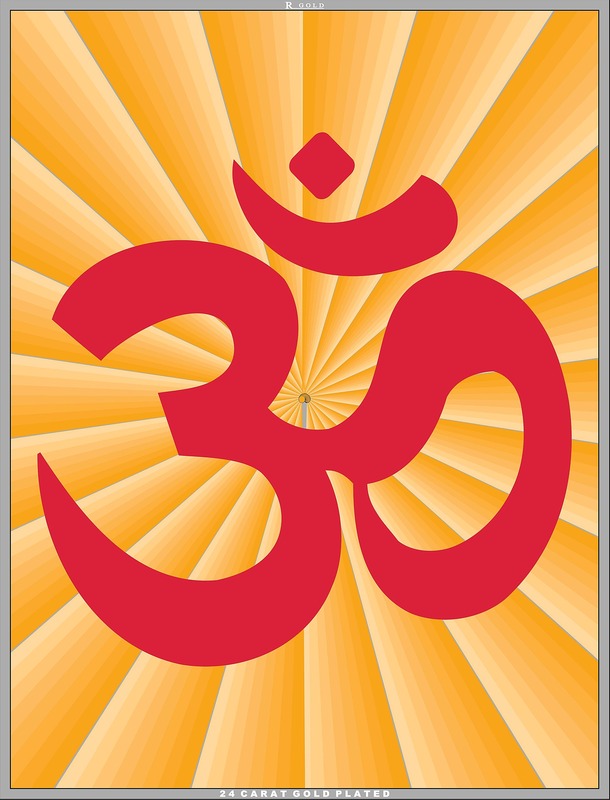 Om is part of the iconography found in ancient and medieval era manuscripts, temples, monasteries and spiritual retreats in Hinduism, Buddhism, and Jainism. AUM / OM Wall picture frame is ideal as gift during birthdays, anniversaries, house warming, special occasions, festivals like Diwali, Dussehra and can also be kept in Pooja Mandir. 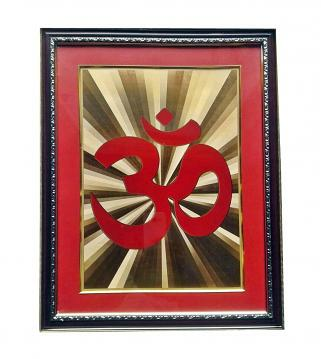 Buy Gold Plated (24 Carat ) OM / AUM Symbol Wall Picture 18" Frame, sold & shipped by Favors Handicraft where you can shop online for Handcrafted Carved Furniture, Home Decor, Statues, Mandir & Gifts. This Gold Plated Frame collection has been tagged as Religious Gift, Transitional Picture Frames, Rustic Picture Frames, Semi Previous, House Warming Weding Gift Set, Natural Finish, Wooden Wall Picture Frames, Single Wall Picture Frames, 16 X 20 Wall Picture Frames, Southwestern Picture Frames, South. 24 Carat Gold Plated Wall Decor Frame w/ Gautam Buddha Picture 18"
Gold Plated w/ 24 Carat Jesus Christ INRI Wall Picture Frame 16"
Gold Plated (24 Carat) Frame w/ Radha Krishna Picture 18"
Radha Krishna Wall Picture in 24 Carat Gold Plated Frame 16"
Gold Plated in 24 Carat Frame Islamic Dua Kaaba / Mecca Madina 18"
Gold Plated (24 Carat ) Ganesha Wall Decor Picture Frame 18"